Why was this research necessary? Located at the northern end of the Great Barrier Reef, the Normanby Basin plays a major role in determining the health of the ecosystems in Princess Charlotte Bay, part of the GBR "lagoon". Until this study very few attempts had been made to measure the sediments being deposited in the Bay. Scientists and policy makers only had models and a scattering of data samples on which to base their understanding of how the Basin actually works. On-ground research and an improved model were necessary in order to make better decisions about land management, rehabilitation, conservation, and new development. This research has delivered a new model, supported by multiple lines of empirical evidence. What were the core research questions? What is the proportional contribution of suspended sediment from eastern Cape York rivers to the GBR lagoon compared with the rest of the GBR catchments? To what extent are the contemporary sediment loads from this area elevated above pre-European levels? Which sub-catchments or stream segments are disproportionately contributing to the total sediment load? Of the current key sediment sources, which ones are elevated as a result of land-use intensification, and can anything be done to practically reduce the supply of sediment from these sources? How did the research answer the core questions? 1. Our data confirm that the Normanby Catchment is a major contributor of sediment to the Great Barrier Reef Lagoon. Our data are in general agreement with previous predictions of the sediment loads flowing from the upper catchment. Importantly, however, our research shows that these loads come from entirely different sources than was previously thought. The new model will help land managers make much more effective decisions than in the past. In addition, we have identified a coastal/floodplain source that is in the order of 4 times greater than the upper catchment derived sources. This finding highlights the urgent need for further research now that the upper catchment is better understood. 2. It is still not easy to determine the extent to which the catchment sediment loads are elevated above “pre-European” levels. What we can say is that the previous models, which predicted a 5-fold increase in sediment loads, are not accurate. Using air photos and stratigraphic evidence, our work does show a catchment-wide acceleration of gully erosion within the last 100 years or so, and this can be tied to the introduction of cattle into the catchment. 3. Sediment load flowing into the Bay can be roughly identified as coming from the upper catchment or the lower catchment. The amount of sediment originating in the lower catchment is about 4 times larger than what originates in the upper catchment. In the upper catchment, alluvial and colluvial gully erosion are major sources of sediment. 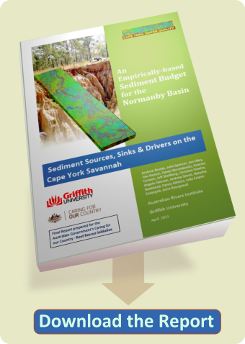 We have mapped these areas across the catchment, and have identified several large concentrations, specifically on the Granite Normanby River, near the East and West Normanby River confluence, and the Laura River immediately upstream of Crocodile Gap. These areas could be targeted to reduce sediment yields through passive and active gully rehabilitation measures. 4. Alluvial gully erosion has accelerated since European settlement, through overgrazing cattle and soil disturbance on the sodic floodplain soils of river frontages. Some of these areas could be targeted with management actions to reduce sediment yields through passive and active gully rehabilitation measures. Roads and fencelines are often associated with erosion processes. Although they are individually small, localised effects, their cumulative impact is significant. There is plenty of room for improvement in their design and implementation. What are the main recommendations coming from the research? We put forward 12 main recommendations, each of which is achievable. Together, they contribute to building a better future for the Normanby basin and the people who call it home.